We are busily preparing for our nineteenth year of exhibiting at the Royal Welsh Agricultural Show and our seventh year of organising “The Traditional and Sustainable Building Skills Marquee” in the Countryside Care Area. 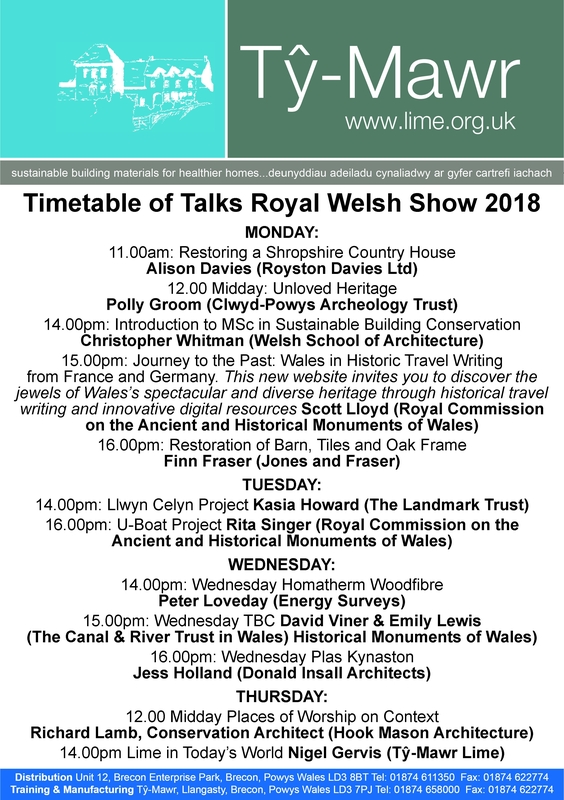 We are pleased to be holding a range of talks again this year on building initiatives, conservation and repair techniques and projects with speakers from a wide range of organisations. To see the full list of talks over the week please see our poster below! Talks are free and there is no need to book but places are limited, so please arrive in plenty of time! As well as our ever-popular exhibition house showing off our wide range of traditional and sustainable building materials, insulations and paints, our technical team will be on hand to discuss our award-winning ‘breathable, natural insulation systems” for roof, floor, and solid wall and timber-frame build-ups - all with Local Authority Building Control Registered Details. This is all happening on stand CCA753! Clients are welcome to join us for refreshments of Nepalese tea, coffee and hopefully Nepalese wine for a donation in aid of Velindre Cancer Care – supporting the Nepal Trek 2019. Book your tickets here for the show itself and avoid the queues!